The Geneosity Family Reunion Guest register is a genealogy-friendly form that is ready to print. Guests to your reunion will be invited to provide their name, city, contact information and their relationship to the family. 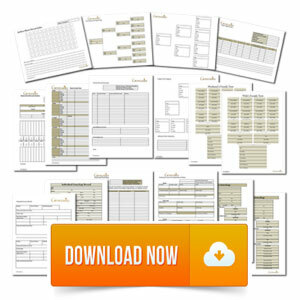 The form is intuitive and easy to use with an example entry to steer guests in the right direction. It can be difficult to know who is who. The suggested entry recommends listing the individual’s relationship with someone else in the family so that the connection can be made clear. It’s so often that distant relatives and cousins attend these events and the record keeper doesn’t understand what the individual relationship of an individual was. This form features eight generously-sized rows so it’s easy to fill out by people of all ages. Be sure to print enough pages to at least cover each individual and couple. 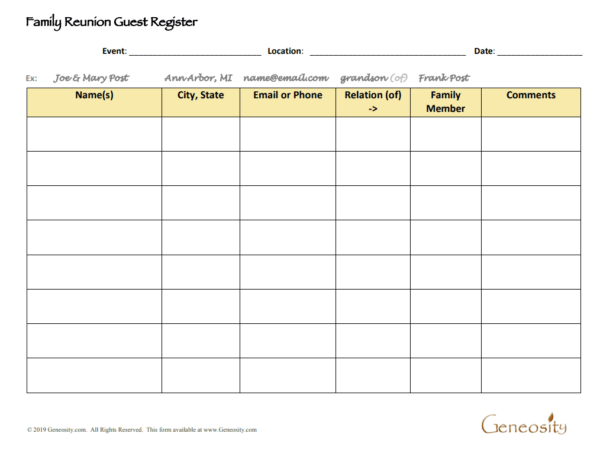 You should also consider printing a copy or two of the Geneosity Relationship Chart for your reunion. This printable chart answers all of the relationship questions from nieces and nephews to fifth cousins. These charts are a very popular reference at family reunions.